Learn about the cross country journey made by three roadtrippers to interview influential educators who are making a difference. Also if you are an educator, share your road and inspire the next generation. Take the TEACH pledge and join the campaign. Your pledge will help to support great teaching organizations like City Year, TNTP, and DonorsChoose.org and will encourage the next generation to become teachers. Have you ever wanted to TEACH? 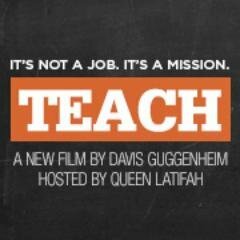 Pledge to learn more about a career in teaching and what it means to "Make More" at TEACH.org. Take our TEACH website survey. Your responses will help us to make the website the best it can be. When you're ready, I would love for you to be a teacher. Provide new opportunities and experiences to students in your community. Teachers inspire students to follow what they love.